Nestled in the side of Ramsgate Plaza, Café 191 is easily overlooked, but for the collection of black umbrellas clustered outside it's door. The café is French inspired, with a relaxed charm which has obviously been designed with the comfort of its patrons in mind. It serves a fairly extensive drinks menu (no alcohol of course), which includes fresh juice, coffee and frappés in a range of flavours, while the food menu covers breakfast and lunch as well as a range of pastries and sweets. While the menu doesn't boast many options, at Café 191 they prefer to concentrate on doing fewer things to a high standard. 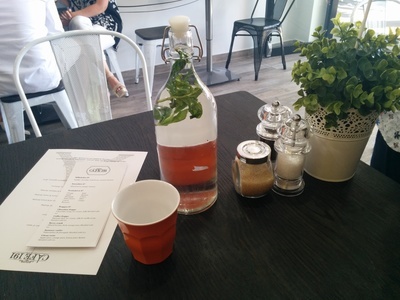 French inspired table settings and complementary mint infused water. 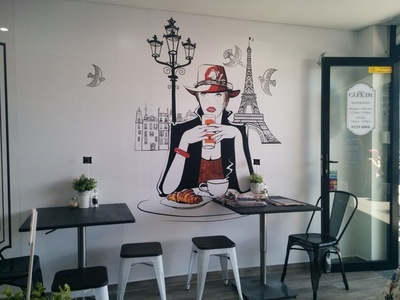 Depicted on the cafés feature wall, a French woman sitting on a small table across from a gold-framed mirror, admiring her own reflection. Her eyes are a pale green, staring coolly as she sips from her rather unrealistic drink. Her red bracelet and clothing scream style (as any typical French-woman's should) and she oozes an effortless chic. All this set to a backdrop of Paris with a wrought iron Eiffel Tower depicted in twisting, graceful swirls. Perched on the table infront, a steaming coffee, accompanied by a croissant, completing the quintessential French breakfast. The quintessential French woman - and that yummy chocolate croissant. The French theme continues through the rest of the décor - delicate white pots hold small plants and display table numbers, and under the mirror sits a long sofa set with soft cushions. 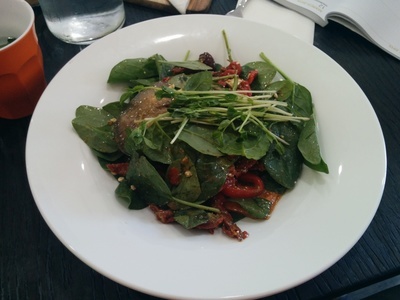 For lunch we chose the Café 191 salad ($13.00) - their own creation with crisp baby spinach, roasted capsicum, eggplant, olives, sundried tomato and fetta cheese in a pesto dressing. The flavours all complemented each other well and the dressing accented and enhanced the flavours without overpowering the rest. While the salad was delicious, after a while the strong flavours became a little overpowering on the palate and I felt they probably could have been toned-down a bit. The Cafe 191 Salad - a tasty mix of Mediterranean flavours. We sampled the staff recommended cronuts (the newest pastry creation sweeping the nation). Bought from a local supplier, this very fashionable croissant-donut hybrid is delicious when done well. Our cronut arrives already cut in half and arranged lovingly on a small wooden board. The rocky road piled on top was fantastic - the soft chocolate, marshmallows and jelly are delicious. Unfortunately, the cronut itself isn't as flaky and light as it should be, which is a bit disappointing. 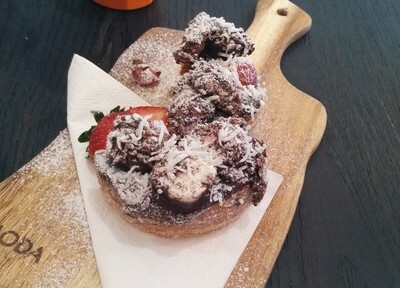 The rocky road cronut - what's more French than pastry, right? The chocolate and salted caramel tart made up for this though. The soft, crumbly base is perfect accompanied by the caramel which is accented with a hint of sea salt. This is then covered in a thick layer of chocolate ganache. This tart is both incredibly rich and incredibly delicious. I can't finish up without mentioning the coffee. It's a lovely mild blend and they did not burn it at all. Best of all, the staff took my request for an iced latte (basically a combination of coffee, milk and ice) in their stride, even though it is not on the menu and it isn't something they know very well. 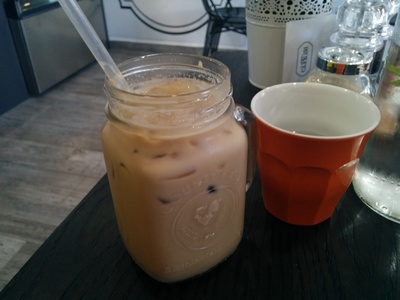 A refreshing iced latte posing as an iced coffee in this novelty drinking jar. Even better, they are eager to talk to patrons about their experiences and take their comments into consideration. The staff are nothing less than accommodating and are extremely friendly. Café 191 with its great staff and peaceful, relaxed atmosphere is well-suited to a lazy weekend breakfast or lunch. Where: 191 Ramsgate Plaza, Ramsgate Road, Ramsgate, 2217. Cost: $10 -$25 per person. When: Open everyday from 6am until about 4pm.